Gloss Sealer. Moisture Protection with a Glossy Finish. The Best Gloss Sealer on the market to provide you with that wet look. Rainguard brings you a high performance modified silicone acrylic water repellent clear sealer for all surfaces. Horizontal and vertical surfaces can both be protected by Gloss Sealer. The high gloss sheen enhances the appearance for all wood and masonry surfaces. Gloss sealer also provides stain resistant protection that is a water based, non-toxic, non-cancer causing formula. Gloss Sealer can help solve moisture problems with a clear gloss, protective coating. All our products are easy to apply and clean up. What makes Gloss Sealer different? A proprietary ingredient called Micro-Lok™. 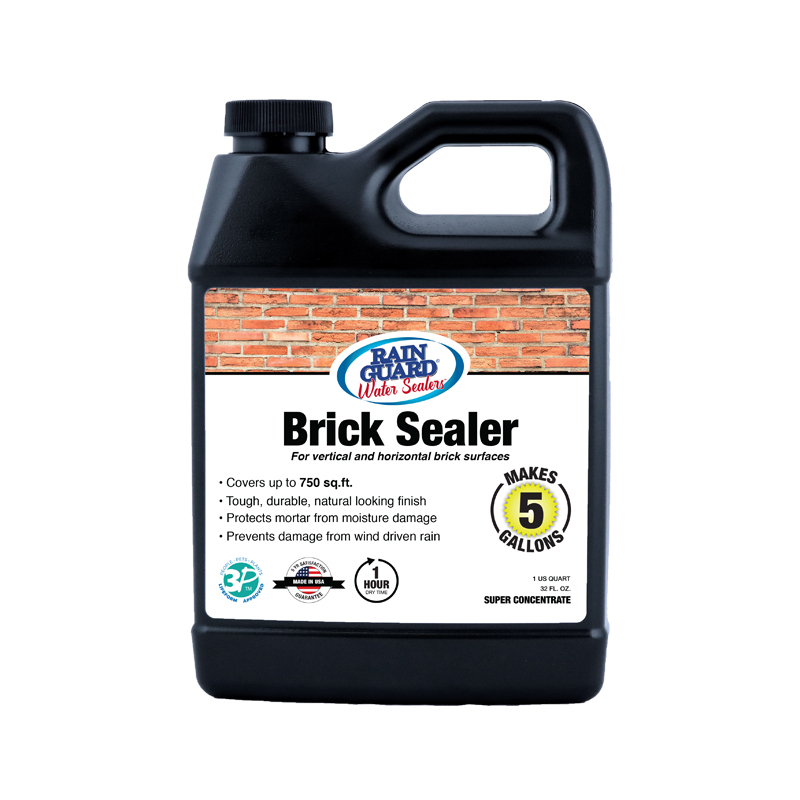 This additive ensures a long lasting mechanical bond and creates a hydrophobic barrier that is not affected by weathering, salt, dirt, freezing temperatures, UV light and wind-driven rain, among many other damaging elements. Want to add an anti-skid additive? Shop Slip Resist here. Gloss Sealer has Outstanding Benefits for You! *Painted/stained surfaces need to fully cure BEFORE sealing with Gloss Sealer to prevent discoloration. Cure times vary, so please refer to paint or stain label for cure time. Sweep, dust, and wash your surface using Rainguard Cleaner/Prep. For heavily soiled areas, use a soft brush to scrub out stains with Rainguard Cleaner/Prep and then power wash normally. Ensure the surface is clean and dry for at least 24 hours prior to application. Use tarp and tape to cover any area that you do not wish to seal. If overspray occurs on glass or metal, immediately wipe away with soap and water. If overspray occurs on plants, spray a little water on the leaves to remove any spots. Rainguard Gloss Sealer is eco-friendly and will not harm the plants should accidental overspray occur. This eco-friendly product is safe to use and easy to apply. Available in both Ready to Use and Concentrates. Concentrates are the best value and mixing is simple. For the quart concentrate that “makes 1 gallon”, just empty the contents of the quart into an empty 5 gallon pail then add clean water to the 1 gallon mark. Helpful hint: If there is no 1 gallon mark visible then first add 1 gallon of water into the empty 5 gallon pail and mark the waters level with a sharpie marker. Or pour contents of quart concentrate directly into sprayer and fill with water to the 1 gallon mark. For a proper application, use a hand pump garden sprayer. Apply 1 (one) even coat to ensure the product seals the entire surface. Once the 1st coat has dried for an hour and/or is tack free (no longer sticky) you may add additional coats to get the desired look. Spray starting at the top and work your way down in a side to side crosshatch pattern. Allow product to drip heavily before moving onto the next spot. Heavily saturate the surface maintaining at least a 6-inch drip or run down. Apply the product until it starts to pool up slightly with a milky-white color. The puddling will even out, so there is no need to back roll. Wait at least 24 hours for light traffic (ex. decor, furniture, etc. ), & 72 hours for heavy traffic (ex. car, etc.) before you use the treated surface. IMPORTANT: Avoid letting any water to come in contact with your newly sealed surface for 24 hours. After full cure time is achieved (approximately 4-5 days) you can expect the full water beading effect.